You will need a sharp serrated knife with a long thin blade, a flat cutting board and a damp cloth - we recommend Victorinox long bladed saw knives. Good fruit cake consists of moist flavoursome fruit held together by a tender cake crumb. 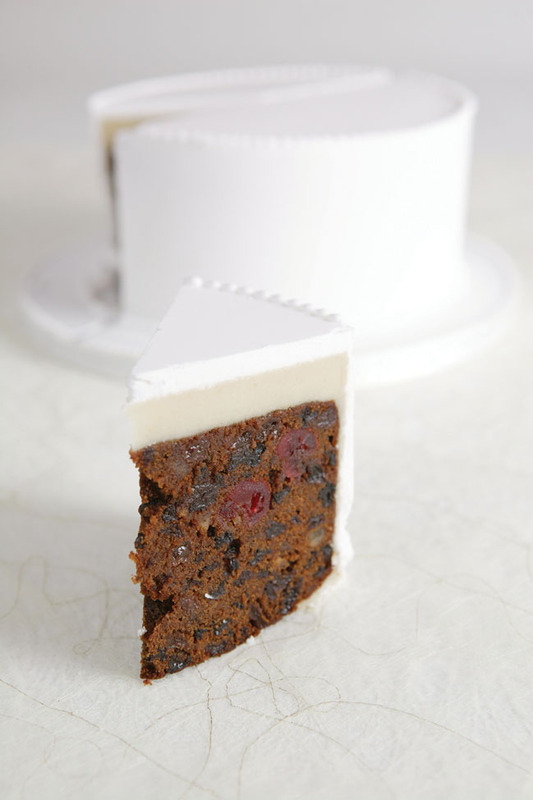 Fruit cake needs care and patience to cut into small portions, or it will crumble! A sharp serrated knife with a long blade is essential; a good SHARP bread knife is usually suitable. Ornamental knives used for the cake cutting ceremony are not sharp enough. USING A BLUNT KNIFE WILL MAKE THE CAKE CRUMBLE! You will need a clean, moist cloth to wipe the blade clean between cuts. The knife will work best if the blade is clean and moist. Use a flat cutting board to work on. First cut a large piece of the cake, about a quarter of a 10" cake. Use a sawing action with the serrated blade - don't try to just push the knife down through the cake - and make sure to cut all the way down to the base board. Next cut through or break off any icing decoration holding the cake to the board at its bottom edge. Then make sure that the cake crumb is not fixed to the board by sliding the knife underneath, between cake and board. Now start to cut the cake into long slices of the chosen thickness, wiping the blade between cuts and allowing the slices of fruit cake to lie flat on the board as you cut them. The long slices can then be cut into smaller portions ready to serve. Any cake not to be served on the day should be wrapped to keep it moist. Cover the cut surface of the fruit cake crumb with polythene or clingfilm and then place the whole cake in a large plastic bag. Return the cake to the box and store in a cool dry place. Fruit cake does not need to be refrigerated or frozen.